They’re not really crabs but are related to spiders, scorpions and ticks. Unlike true crabs, they have no antennae and no mandibles (mouth parts for grinding food). Like spiders, they have a pair of chelicerae, small appendages for moving food into their mouth. They have lots of eyes: Their double “lateral” eyes on top of their shell are primarily for finding mates. Plus, they have five more eyes on top of their shell, and one set is sensitive to ultraviolet light. (Their tail has light sensors along the top and side, too.) And on the crab’s underside, near the mouth, are two eyes that may be used while swimming. They have a big heart: It’s a long tube that extends almost the entire length of their body. 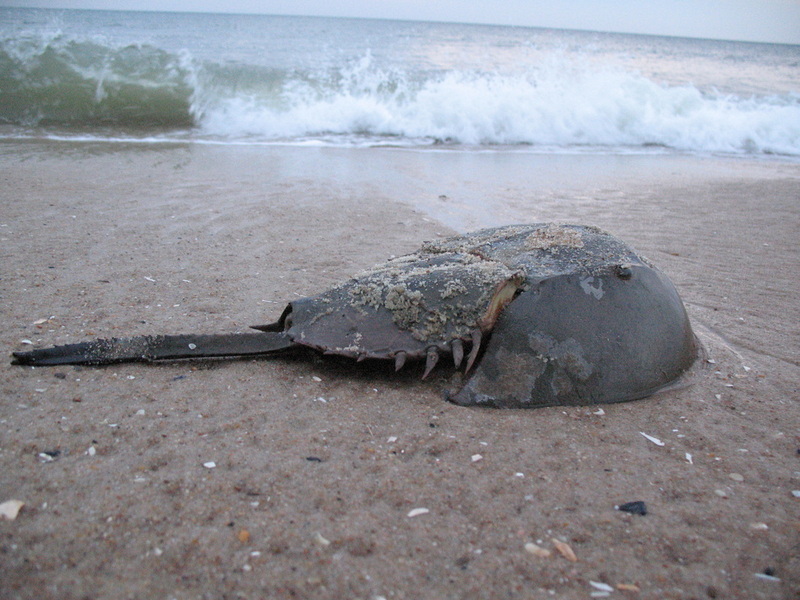 On average, the heart rate of the horseshoe crab is 32 beats per minute. Their mouth is in a weird place: It’s in the center of their body, where the legs attach. The crab uses its hind legs to help break up food and its front appendages to put the food in its mouth. The females lay lots of eggs, about 90,000 in one season. They take a long time to grow up, reaching adult size in 10 to 11 years. They help us stay healthy: An extract of the horseshoe crab’s blood is used by the pharmaceutical and medical device industries to ensure that their products, such as intravenous drugs and vaccines, are free of bacterial contamination. Horseshoe crabs “donate” blood much like people do, and then the crabs can be released back into the sea. Also, chitin, a hard substance found in the crab’s outer skeleton, is used to make filament for medical sutures and wound dressings for burn victims. They help other animals survive: Shorebirds eat horseshoe crab eggs exposed on the water’s surface. And sea turtles feed on adult crabs. What can you do to help? 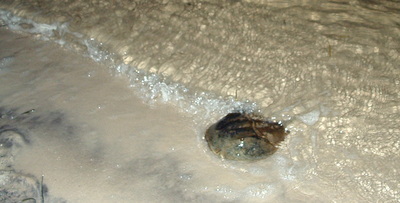 Lots of horseshoe crabs die when they’re stranded upside down during spawning. So if you see crabs endangered in this way … just flip ’em!